Since before recorded history, humans have fashioned shoes in an almost infinite variety of styles and materials, optimized for thousands of specialized purposes. That breadth is captured in a new book of photos, 10,000 Years of Shoes (University of Oregon, 2011) by Pulitzer Prize-winning photojournalist Brian Lanker (1947-2011). Accompanying the images are three essays; in the one excerpted below, "Luther Cressman and the Fort Rock Sandals," Thomas J. Connolly, MS '80, PhD '86, director of archaeological research at the UO Museum of Natural and Cultural History, tells the story of the world's oldest known shoe. Roughly 15,000 years ago, as the Ice Age waned, humans migrated into the Americas from northeast Asia. By land or by sea, this migration was impossible without clothing that protected people from the cold, including footwear. Some of the earliest evidence for humans in the Americas comes from the Great Basin—a region that spans parts of Oregon, Nevada, and California. People camped at Paisley Caves in central Oregon almost 14,500 years ago. To the north, Fort Rock Cave overlooks a broad basin that once held a huge lake where wave erosion carved numerous caves and rockshelters at the water’s edge. When the first Americans arrived on the continent, the massive lakes had shrunk to shallow marshes. Rich in edible plants and game animals, the area attracted people who sheltered in these caves. Millennia later, these dry and dusty Great Basin caves also attracted archaeologists—and there they found some of the world’s oldest shoes. Archaeological excavations at Fort Rock Cave in 1938 by the University of Oregon’s Luther Cressman led to the discovery of nearly 100 sagebrush-bark sandals buried by wind-blown silt and later by Mazama ash from the cataclysmic volcanic explosion that created Crater Lake. At the time of their discovery, these sandals could not be precisely dated, but their position below Mazama ash suggested that they were truly ancient. Luther Cressman was a professor of anthropology and founded the Museum of Natural and Cultural History. However, he could scarcely have predicted where his life and research would take him. Cressman grew up on a farm in Pennsylvania and attended Pennsylvania State University, where he earned a degree in English. After a brief army stint in World War I, he trained for the Anglican ministry and completed graduate studies in sociology at Columbia University. There he was mentored by the influential anthropologist Franz Boas and also met and married his first wife, Margaret Mead (1923–27), who later became a world-famous anthropologist. He later married Dorothy Cecilia Bloch and in 1929, at the age of thirty-two, moved west to take a position in sociology at the University of Oregon. Cressman’s first step into archaeology was more by circumstance than planning. In 1930, he was invited to investigate several Indian burials exposed in a farmer’s field near Gold Hill in southwest Oregon. Awed by the opportunity to learn of “human beings and their works,” he acknowledged that the endeavor was neither the sociology nor cultural anthropology with which he was familiar. Recognizing his shortcomings in geology, botany, zoology, and other fields critical to interpreting archaeological sites, he sought the help of specialists in a multidisciplinary approach that marked his entire career. Cressman followed his serendipitous entry into archaeology with a plan to systematically document Native rock art. He wrote to postmasters throughout Oregon to contact people who knew of petroglyphs and pictographs, followed by an extended field trip in 1932. Talking with ranchers and amateur historians, he learned of caves and rock shelters with the potential to hold a long record of human history. Today, it is difficult to appreciate the obstacles Cressman faced in pursuing fieldwork in the 1930s. At that time, there were only two paved highways in eastern Oregon; a north-south route along the base of the Cascade Range from the Columbia River to the California border, and an east-west route from Bend to Boise. Neither provided access to the areas that drew his interest, where detailed maps were nonexistent. In 1935, Cressman planned his first excavation at Catlow Cave, south of Burns. The site produced a wealth of twined basketry of a distinctive type now known as “Catlow Twine.” Three years later, he and his crew spent a week at Paisley Caves and another week at Fort Rock Cave and found artifacts well below Mazama ash. At the time, most archaeologists considered the Oregon cave materials to be less than 2,000 years old. However, Paisley Caves produced artifacts that appeared to be directly associated with the bones of extinct horses and camels, animals that disappeared from North America more than 10,000 years ago. These associations provided evidence that people were present in the region thousands of years earlier than previously thought. Cressman’s colleagues remained skeptical until 1951, when the new method of radiocarbon (14C) dating vindicated him. When first found, the age of the nearly 100 sandals from beneath the Mazama ash layer at Fort Rock Cave could not be precisely known. Radiocarbon dating showed that the Mazama ash was deposited about 7,600 years ago. Cressman directly dated a sandal, buried deep beneath the ash, to more than 9,000 years ago. Subsequent 14C dates have shown that Fort Rock–style sandals were made between about 10,250 and 9,300 years ago—the oldest directly dated shoes in the world! Cressman and his crew carefully plotted the position of many of the sandals as they found them. They were distributed in an arc around a living area, suggesting people threw them away. Excavations of nearby sites show that brush shelters were often built in caves to conserve heat and protect people from icy winds. Such a shelter may have been present in Fort Rock Cave. The Fort Rock sandals may have been winter wear, since the Klamath Indians who still live in the area historically made shoes from tule reeds stuffed with dry grass that provided comfort even when walking in icy marsh waters. 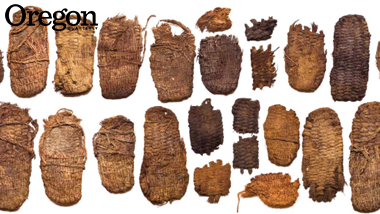 Most of the sandals from the cave are heavily worn, and many are fragmentary, supporting the idea that they were discarded rather than stored for later use. Seeing them as a group, it is impossible not to be moved by the people and community they represent. There are large adult shoes for men and women, child-sized shoes, and those for mothers and uncles, sons and daughters, cousins and grandparents—the extended family who made the cave their home 10,000 years ago. Some sandals are caked with mud, others are mud-free, illustrating the varied environments they visited for hunting, food harvesting, or play. Many sandals are worn through at the balls of feet or at the heels, allowing you to trace the toes and other features of the feet that occupied them. Looking at one pair with well-worn soles and tiny char marks on the toe flaps, one can visualize sparks rising from a crackling hearth fire, as their wearer added fuel or paced the floor as a grandmother might. Found in caves throughout southeast Oregon and northern Nevada, Fort Rock–style sandals are stylistically distinctive. They disappear by about 9,300 years ago, after which other sandal forms take their place. Luther Cressman’s excavations un-earthed shoes that tell us about the people who wore them, the environments they lived in, and the community that sheltered in Fort Rock Cave—providing future generations the opportunity to study, interpret, and admire the oldest shoes in the world.